For beginners, MeeGo is a Linux based open source mobile operating system project which was announced at Mobile World Congress in February 2010 by Intel and Nokia in a joint press conference. With Nokia deciding to partner with Microsoft, the fate of Linux based MeeGo OS now hangs in balance. Or so we thought. But there is some good news for all open source folks out there. Intel is not yet ready to call it day and has made it clear that it intends to develop and push MeeGo platform ever further. "Our Decision and Resolve on MeeGo Has Only Grown Stronger"
In a fateful move earlier this week, Nokia has decided to partner with Microsoft and it intends to use Windows Phone 7 as its primary OS replacing Symbian. This was one shocker of a news for all those who loved and supported Nokia's MeeGo open source project. MeeGo is not Nokia's top priority project anymore and that space will be filled by Microsoft's new Windows Phone 7(WP7) mobile OS platform. Does this mean end of the road for MeeGo open source project? Not yet. 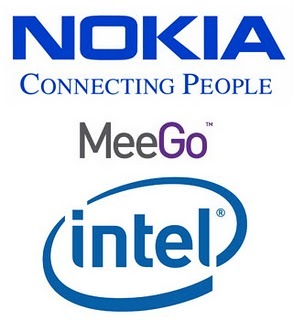 Renee James, senior vice president and general manager of Intel's software and services group, during a press conference said, "Intel is disappointed at Nokia but life goes on, our decision and resolve on MeeGo is only stronger." So there is still hope and MeeGo platform is far from dead. She went on to list the big shot MNC's that are currently participating in the development of MeeGo OS which included Intel's competitors like Advanced Micro Devices(AMD), Texas Instruments(TI) and ST Ericsson; operators including Orange, Telefonica and Sprint; and software companies including Novell and Wind River. To demonstrate the continued progress for the software, Intel showed off a new user interface for MeeGo running on tablets during the Mobile World Congress currently being held at Barcelona.